Design a necklace mixing gold and silver to create a stylish and meaningful accessory you will love. First choose a chain and then you can choose to have the stamped initial heart pendants in all one metal or mix them up ~ whatever suits your taste! Price includes a 16" silver chain with one stamped charm. If you change chain length/metal or add charms the price will change. Available in 16", 18", 36" or 40"
As you can see, we love to mix metals and textures to create pieces that hold meaning and are stylish ~ and that is why the Amore Necklace is one of our favorites! You can either choose all silver, all gold or mix the two! 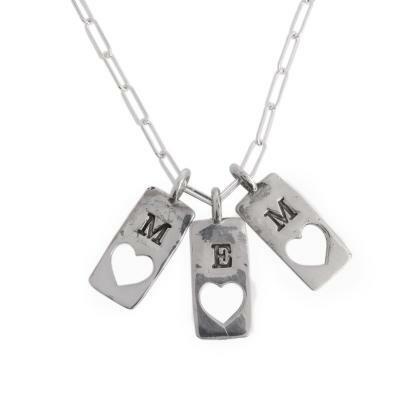 We pair a link chain with our heart pendants stamped with initials of those you love. And can't decide on length? We have it available in lots of lengths to fit your style! All silver is sterling and gold chain is gold filled. Gold charms are gold bronze. Heart pendant charms are approx .25" x .5". Each charm is stamped with our block font in a capital letter. Chains are available in 16", 18", 36" or 40". I bought this necklace for my mum and she absolutely loved it! I purchased the 16inch length chain and it fit perfectly. Well-made and fast shipping!